Samsung Galaxy Tab S4 has been launched in India. This tablet was first launched in August. It comes with Samsung DAX and S Pen integration. It also has an alternative book cover keyboard that lets the user experience a notebook-like experience. The Samsung Galaxy Tab S4 has a 10.5-inch Super AMOLED display. Samsung has given proprietary dual mode in this tablet which helps in multitasking. Apart from this, there is also Samsung Knox integration, which is about the level of defense security of mobile security. 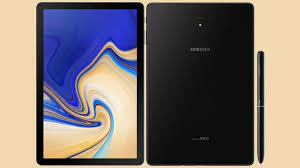 Samsung Galaxy Tab S4 price in IndiaSamsung Galaxy Tab S4 will be sold in India for Rs 57,900 The tablet will be available in Black and Gray in the Samsung Online Store and offline Retail Store. Apart from this, this device will be exclusively sold on e-commerce site Amazon India from October 20. Under the launch offer, customers will get 5,000 bucks cashback if they use HDFC Bank's credit card to buy this Samsung tablet. The tablet comes with instant live cashback offer. Cashback of Rs 2,750 will be done by Geo, which can be used with Recharge plan of Rs 198 and Rs 299. Apart from this, using the Geo Cashback coupon, customers will get double data for the next four recharge. Samsung is selling separately the Keyboard Book for its Galaxy Tab S4 at Rs 7,499. Its common book cover can be bought at Rs 3,999 and Pogo Charging Dock for Rs 3,499. Samsung Galaxy Tab S4 Specifications and FeaturesSamsung's tablet is an upgrade to the last year's Galaxy Tab S3. Samsung Galaxy Tab S4 runs on Android 8.1 Orio Samsung Experience UX has been used on this. This tablet has a 10.5-inch WQXGA (2560x1600 pixels) Super AMOLED display. This is a 16:10 aspect ratios and 287 PPI pixel density screens. The Qualcomm Snapdragon 835 processor has been used in this tablet. The highest clock speed is 2.35 GHz. Jugal Bandi has 4 GB RAM. The rear camera is 13-megapixel rear camera with F / 1.9 aperture on the back. The front panel has an 8-megapixel sensor with F / 1.9 aperture. Speaking of storage, this device has two options in the global market - 64 GB and 256 GB. But a 64 GB model has been introduced in India. It supports up to 400 GB MicroSD card. The tablet has got connectivity features like Wi-Fi 802.11 A / B / G / N / AC, Bluetooth 5.0, GPS + GLONASS and USB-Type C. Accelerometer, compass, gyroscope, hall sensor, RGB, proximity and iris scanner are part of this device. Samsung's tablet battery has 7300 mAh, which supports fast charging. The dimensions of the tablet are 249.3x164.3x7.1 millimeters.